This suburban parish of around 6,500 people is almost entirely housing, from Victorian and Edwardian to 1970s and 1980s estates, a recent retirement village, and three residential/nursing homes. 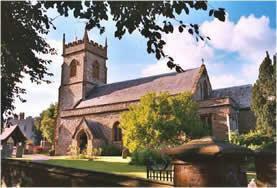 It borders Taunton’s CBD, a park, and golf-course, and includes Parkfield LA Primary School [c.400]. Wilton parish used to include the Galmington and Comeytrowe areas [where Bishop Henderson School has most of its catchment], and St. George’s members played a large part in the establishing and building of the school and St. Michael’s Church. St. George’s church was expanded in the C19th., and some recent re-ordering has provided more flexibility and digital projection. Adjacent are a hall used extensively by local community groups, and allotments. There is a vicar, an NSM associate vicar [currently the Bishop Henderson School Chaplain], a training curate, and two active retired readers and a priest. We employ a part-time administrator, music director, and hall caretaker. There is lively involvement of the membership [c.175] in church, community, and voluntary work [one of the largest MU branches in the diocese]. Many church members are over sixty, but there are some young families on Sundays and many at the monthly ‘Buggy’ service. Worship ranges from traditional to creative and modern, including charismatic, sacramental, and evangelical elements, with a wide range of music styles. Sunday collections are given to nominated charities. The Church Council shares its work with four Committees: Worship, Nurture, Outreach, and Premises. There are about 15 Baptisms and 12 weddings each year. Various children’s and young people’s groups are catered for: uniformed organizations, pre-school ‘Praise and Play’, ‘Surf’s Up’ primary age-range, and ‘Pathfinders’ for secondary level, and two Holiday Clubs are run each year. We have some partnership in a ‘Local Ministry Group’ of five neighbouring parishes, supporting each other’s clergy and parish events. We have personal links with three mission partners, in Mongolia, Pakistan, and South Africa.